What is the number one reason why people play more golf? A popular answer seems to be that people just don’t have enough time to play. A round can take anywhere from three to five hours (and sometimes longer, yikes!) and nowadays there just doesn’t seem to be enough time in the day to justify playing a round of golf. 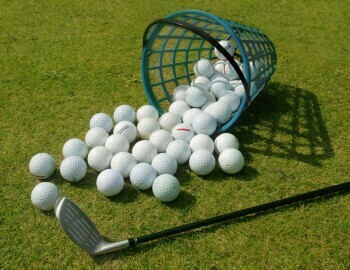 Hitting a few balls at the driving range is one way that golf enthusiasts cope with not having enough time to get on the course, and going to the range in the summer is perfect for its long days and warm temperatures. When the fall hits, though, you might find less people heading out later in the day to practice. At Rock Manor, you don’t need to worry about the days getting shorter anymore! When the sun goes down, our new range lights turn on! With two fully functional light bays on our range, you can practice well into the evening and get your golf fix after work, happy hour, or even dinner! Combine that with our restaurant, the On The Rocks Pub, and you have a place where you can bring the family for an end of summer night of fun. Come check out the new range lights at Rock Manor and see for yourself how easy it is to keep working on your game even when the sun goes down. We have daily range specials every day and our range is open from dawn until dusk from Sunday – Wednesday, and until 10PM on Thursday, Friday, and Saturday! Click the “Range” tab to learn more about our range and even get yourself a Range Express Card to save even more. We hope to see you soon!